Marquee weddings are my favourite type of wedding, so for any of you who are not sure if this could be an option for you then here are my 5 reasons why I LOVE a marquee wedding to try and convince you! When it comes to marquee weddings, you have masses of choice! Broadly speaking you get to choose everything as it is a pop-up event space, everything is selected and chosen by you. 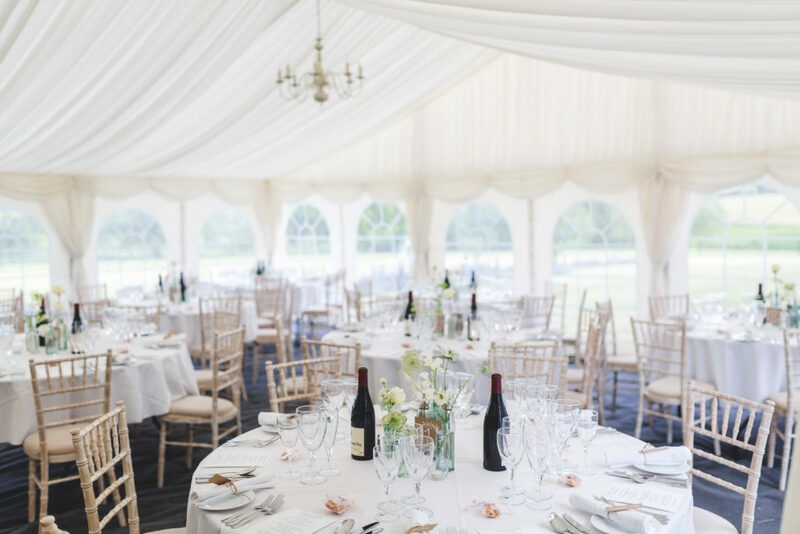 This will start with the address your marquee will be installed at, go through to the timings of your day, the style of the marquee you wish to hire, the size of the marquee, the finish of the marquee, and all the fittings and fixtures within the marquee. In terms of your day, you get the maximum amount of choice with a marquee – there are far fewer restrictions on your wedding day than at any other style of venue. If you have set ideas and are struggling to find a bricks and mortar wedding venue that will provide it then a marquee is probably going to fulfil your needs. Because you are bringing everything you need for your wedding day onto the marquee site you have masses of flexibility. You have more flexibility with your guest numbers, the start and end time of your day and with the suppliers you commission to deliver your day. 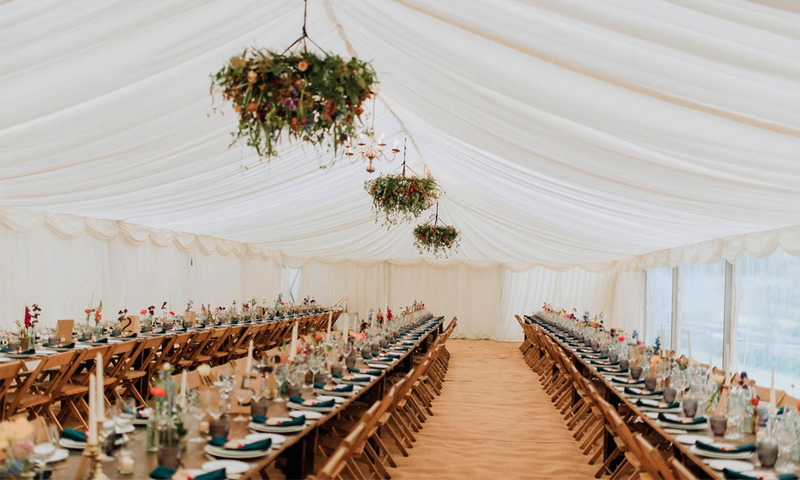 Many wedding venues will dictate the start and end time of your wedding (often due to legal restrictions), they will offer packages for your food and drink and the furniture you must use, where as with a marquee you have the flexibility to pick all of these things. Wedding venues often have a ‘Preferred supplier list’ which may be commission based, and they will encourage you to pick your suppliers from this list (and in some cases you absolutely have to pick your suppliers off their list). If your guest numbers fluctuate you also have the ability to expand or reduce the size of a marquee to accommodate so you are only paying for the space you need. Guest numbers can often be a real problem to get confirmed so with a marquee this is less of an issue. Also, some venues will offer drinks and food packages for your whole wedding day, from reception canapés through to evening food and everything in between, having a marquee means you don’t have these restrictions so you have more flexibility in catering for your guests. As I mentioned above, with the benefits of flexibility and choice you can control your budget more carefully. You would only hire in items you actually needed, you can pick the style and size of marquee which fits your budget. With the flexibility to pick the suppliers you want to work with you can pick suppliers that fit your budget and will provide the exact service you require. One of the biggest expenses of a wedding is the venue and although marquee weddings are not a cheap option, you have lots more options to tailor your day in every single way, from the marquee to the food, drink, decor and entertainment to keep your expenditure more controlled. Marquees can basically go anywhere! 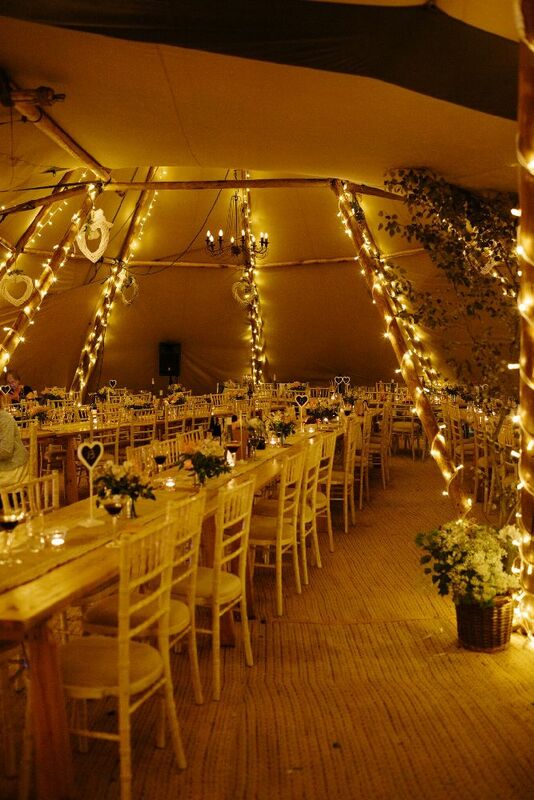 If you love the outdoors then a marquee maximises the best of your wedding’s surroundings. With panoramic windows you can have the most amazing views of the countryside, or estate, in which it is sited. 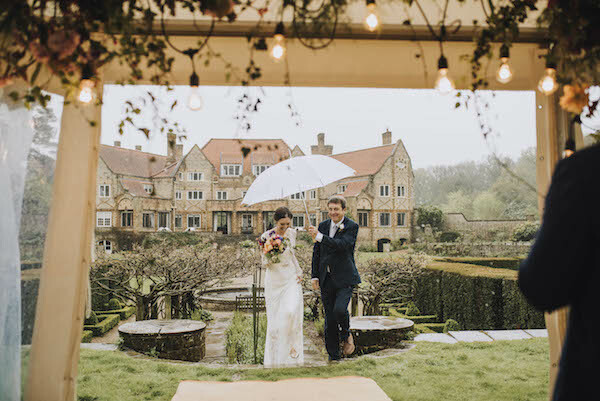 Most brides and grooms that pick marquees love the fact that they can bring the outside into the marquee and if the weather is fine enough the whole marquee becomes the outside; with the side walls pulled back you can really be at one with your surroundings, with unadulterated views. 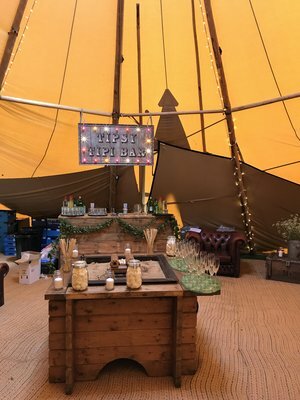 Marquees can also be great add-on spaces to existing venues so if you need a room extension then bolt a marquee onto the outside and simply extend the room seamlessly to create extra celebration space. Marquees offer the ultimate event blank canvas. Unlike bricks and mortar venues, marquees can be a variety of shapes to create the space which will offer you and your guests the best event experience. Being a blank canvas you can completely personalise every element of your day to make your wedding day completely unique to you. I love the fact that marquees become a representation of my couples and their personalities. Admittedly you need to think beyond the usual wedding paraphernalia and get into table sizes, linens, lighting, portable toilets, generators etc etc and all sorts of other necessities that you would never dream of but YOU have complete freedom to personalise every single one of these elements. While all this is extra work, it is massively rewarding as every single one of your guests will get to experience your wedding day exactly as you wanted it to be, complete with all your personal touches. You may be interested in receiving my Marquee Checklist which can be downloaded here, or alternatively if all this has scared you then maybe some professional planning advice could be what you need? If so drop me an email and we can chat further and I can then create a bespoke proposal of my services, tailored to your exact needs.